“What is the most seductive fragrance you remember?” She asked. I thought for a while. I knew I would get a punch if I said Biriyani. It was not the time for kidding. The store was closing. The mall looked deserted but she was there just for me trying to educate me. I put my finger over my nose, quite instinctively as if it would remind me what the most seductive smell I have ever experienced was. “Shikakai,” I said finally. She gave out a sigh. “I mean not just some shikakai. There are a lot of other things involved you know. On a Saturday morning, taking time to apply coconut oil. And then taking bath in warm water with shikakai paste, you will never know how it was. Only after the bath, after we dry our hair, it slowly emanates. And at that time” I took a deep breath. I wish she could feel what I was feeling at that moment. She let out another sigh. She looked as if she was waiting for me to continue. “Right at that moment, you hear the sautéd spices getting poured into the hot sambhar and that smell..” she gave up. “Hey wait. I really need your help. It is almost like life and death matter.” I stopped her. “Just tell me what you want.” She said. “Give me something that smells like love,” I said. The perfume shop was situated on the ground floor just at the entrance of the mall. I wanted to buy something for my girlfriend. Something good and something special. I have said it to the attendant before. The girl turned around. “Did you plan to use this sentence before you walked into the shop?” she asked. “Okay. How long have you been with her?” she asked. “Just help me to get you the perfume your ‘she’ would like,” she said. There was suddenly a sparkle in her eyes. But I don’t know how to tell her. I was sure I would be laughed off. We haven’t involved our friends or family that we were going out. I chuckled. We have met exactly three times. Over three weeks. I have known her exactly for three weeks. “Three weeks,” I told her. She smiled. I was expecting a smirk. But it was a smile. So far so good. She picked up a bottle from the shelf. She sprayed a little in a white strip, shook it and gave it to me. “Smell it,” she said. It was a pleasant perfume but had tanginess to it. The immediate flowery fragrance took me by surprise as I closed my eyes and took it all in. “Does it smell like love?” she asked. It was as if she was reading from a teleprompter in my forehead. How could she know? I looked at the strip and then again at her. “So if I say I am going out with her for over a year now, what would you suggest? Pepper spray?” I asked. She laughed aloud. “Not at all.” She walked to the next aisle. I followed her. There was a perfume with a neat bow like the cap on the perfume bottle. She repeated the same thing with the strip and gave it to me. What first hit me was the rose fragrance. I remember a friend who used to press rose in her biology assignment all the time. She used to do it to make the teacher give her good marks. “It is dried rose,” I said. “You know your fragrances,” she said. “Not really” I was shy. “This is a best to give to a girl who has decided to stay with you. By now you would have seen her flowery portions and the thorns. You would be now an expert in navigating the thorns to reach the petals. Also, there is an orange flavor.” She said. I didn’t get it. “Give it some time,” she said. I waited for another thirty seconds before I took a whiff. Yes, it had. I felt like I had just had a shot in my arm. “It is energizing right?” she read my mind as usual. Maybe she had seen similar reactions with a lot of customers. I merely nodded. “What if I get married to her and want to give something to her after… say five years?” I asked. “Do you really love her?” she asked. I looked at her. I was not sure whether to tell her or not. It was not something I would tell it to a stranger. But at that moment, she disappeared and the eyes that captivated me, which pulled me in and held me prisoner came to me. Do I really love her? I shook my head to come to my senses. She was still looking at me in the eyes. It was like she was pleading through her eyes to get an affirmative reply. It was not the eyes of collective women all over the world expecting an affirmative answer and action. “Then come with me,” she said and walked to the previous aisle. The tester bottle she held up had me in the first glance. It had a great shape and texture that I loved to touch. The golden liquid inside the bottle seduced me in seconds. I would have given anything to buy the bottle then and there. When she gave me the strip, I felt like I was in a temple, right in front of the Devi. But there was something so modern about it too. The fragrance was a mix of jasmine, rose, mint, and everything that is used in the garland for the temple deity. “Do you drink?” she asked. “No. It has a shot of bourbon vanilla to it. That gives a touch of masculinity to it” she said. I smelled the strip again. She was right. That was the modern thing I failed to grasp. “I didn’t know perfumes have so much philosophy to it,” I said. “Can you gift wrap this?” I gave the strip back to her. She gift wrapped the perfume and billed me. “I really hope you come back after a year and after a few years too.” She said. “So this is what how love smells like?” I asked her before I put the gift box in the bag. “You will never know till she wears it for you.” She smiled. I waited for her to close the shop and we walked out of the mall together. My girlfriend transformed to a little girl in pigtails when she had the first spray in her wrists. We were sitting across each other in a restaurant. She gave a sniff and lent her hand to me. I took her palms and leaned forward. The flowery flavor bloomed right in front of my eyes as I watched my girlfriend and it gave away to a vision where she was with me the next year, and the next and the next. “It smells like love,” I said. This is it. Every. Single. Time. 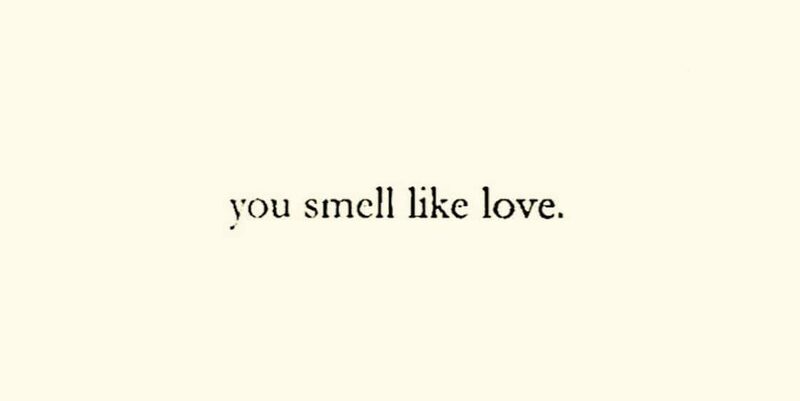 Surely, smells like love! Wish you all happiness Brags 🙂 love this piece! I am in love with this new series! Both the current and the previous one was awesome! Sweet and well written! Totally loved this… I wish I met such a person in a perfume store… sadly many don’t even know the notes! 🙁 Ok coming back to the story… smell of love and the stages it goes through is written well 🙂 Something to remember. I first came to know about the notes of perfume from your blog long back in 2012-13. Mi Amor is now teaching me slowly. It is an enchanting experience. prasanna, thanks a lot for the post.Really thank you! Much obliged. Good one Prasana. The warmth of love was all through it.